Our professional team is committed to providing you with stunning orthodontic results that last for life. We provide our patients with holistic treatment to heal the patient completely. We provide patients with continuous education to make sure our patients receive the best guidance and assistance. Conveniently located in Brisbane, Braces`n’Faces is a newly refurbished practice that focuses on straightening and aligning teeth, as well as treating issues that affect the facial structure underneath. At Braces ‘n’ Faces you have two teeth whitening solutions to choose from. Come in and see us for your free consultation and we can assess your needs to determine exactly what will work best for you. Our team of experienced professionals have worked with a wide range of clients over the years and they are sure to have a simple solution for you. The revolutionary introduction of Invisalign is a preferred treatment for teeth that require mild or moderate orthodontic work. The teeth are straightened and shifted into alignment with a fitted mould changed every two-weeks to accommodate for movement. No one will know you are straightening your teeth with this clear and comfortable innovation in braces! Damon Braces are ligating and self-ligating brackets in a reflexive no-rubbers system allowing ease of movement. This eliminates the need for metal or plastic ties to cause any further strain on the teeth. At Braces ‘n’ Faces our braces are tailored and are made unique for the individual you know you’re getting the best possible result.. If you’re looking for Brisbane Orthodontics treatment you need a great team of professionals that you can trust. At Braces ‘n’ Faces in Brisbane we know just how daunting a trip to the dentist or orthodontist can be so we go out of our way to make the experience a positive one so you can relax and get the most from your visit. Our aim is to educate you along every step of the way so that you know exactly what to expect now and into the future. We know that helping you understand is the first step to a great experience and we enjoy nothing more than seeing a bright (white!) smile at the end of every visit. With our committed team of professionals you know you are getting a holistic treatment to ensure you get exactly the results you want with all the support and reassurance that you need. Whether you simply need to straighten or align your teeth or something more involved, you can rest easy knowing that you have some of the best Brisbane orthodontics professionals on your side. We understand that beautiful smiles are not created overnight. Visiting Braces ‘n’ Faces for your first consult is your first step towards that beautiful smile you’ve been craving. Your first consultation with us is free of charge so the team can give you a detailed consultation and provide you with the information you need. What are you expecting from our services? Speak to our professional staff today about what you want and we will talk to you about the best way to achieve it. You’re putting your trust in us so we want the final result to be exactly what you imagined. Orthodontics aren’t just about a straight white smile, here at Braces ‘n’ Faces we also treat patients with breathing difficulties and sleeping disorders. Something more important than straight aligned teeth is your health. Breathing difficulties can result in many ongoing issues such as stress, chronic fatigue, performance deficiency and many other psychological changes. Providing our patients with interest free payment plans is just one of the reasons Braces ‘n’ Faces is so successful. Making your treatment as easy and stress free as possible is our pleasure. We are not your average orthodontist. Our newly refurbished office is both child and adult friendly, with our comfortable lounge chairs and bright friendly staff we bring a totally new feel to the orthodontists. Sit and relax while we take care of you. We understand that a trip to the orthodontist can be a stressful experience, that’s why we do everything we possibly can to help you relax, knowing that you are in safe, caring and experienced hands. Book your free consultation today and feel the difference! Our Philosophy at Brace ‘n’ Faces aims to provide patients with holistic treatment. Our professional Brisbane Orthodontics team are committed to providing you with stunning orthodontic results that last for life. Our practice works in conjunction with allied health chiropractors to ensure every misalignment is corrected to maintain perfect oral health and overall wellbeing. At Braces ‘n’ Faces every patient achieves a result that they are proud of! This is a question that we are asked frequently; the Australian Orthodontic societies suggest that first assessment should begin when a child is about 7 years old, as this is when adult teeth begin to grow. While 7 may seem too early it is highly recommended, as early assessment will ensure the orthodontist can detect any problems that could occur. This allows the orthodontist to take a proactive approach to possible treatment, meaning planning of treatment can begin, minimising expense whilst maximising possible improvement. If a problem occurs early on and is neglected or not treated on then it is likely to get worse as time passes, the sooner a problem is treated the better the likely outcome. While some problems may not be treatable right away it is still good to have an understanding and idea of what direction you will need to go in the future. 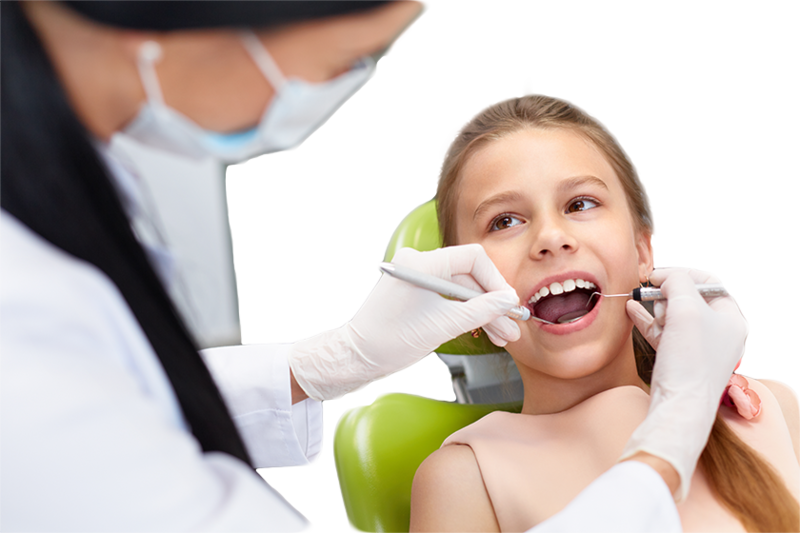 Orthodontic treatment on children will have a permanent effect their teeth, while potentially also changing their face, so it is needless to say that you should only let a qualified orthodontist carry out any assessment or work needed. Here at Braces n Faces we only have qualified orthodontists that are assigned these tasks, ensuring that you are in safe hands at all times. This is something that can vary depending on the severity of the treatment, the more complex procedures will take more time, while more straight forward procedures will take less time. However, on average, you can expect orthodontic treatment to last between 18-24 months. There are cases where treatment does last longer than first anticipated, this is normally down to patients not being fully compliant with scheduled appointments. We therefore recommend that when scheduling orthodontic treatment with us you are as compliant with appointments as possible, this just helps move the whole process on as planned, ensuring maximum efficiency. There are many different types of orthodontic treatments available, and as a result there are a range of different techniques our orthodontists will use to treat your problem. Depending on the severity of the problem different measures will have to be taken; our simpler treatments will use appliances such as plates. However, more complex procedures may requires fixing braces, some on the outside and some on the inside of your teeth. The cost of your treatment is often related to how difficult the procedure is to complete. Price is closely related to the length of time the procedure takes.